Filipino Miss Universe fan Marv Rio C Ramo took to his Facebook to share his take on the recently concluded Miss Universe 2017 in Las Vegas, Nevada. 1. The judges were sitting too far from the stage. They were seated not at the center view but at the right side. They looked at the monitor in front of them to see the girls. It won’t be a fair judging if you can’t judge the girls based on how they perform on the stage and just look at the monitor/camera. 2. The Aces and Queens people and Jonas Gaffud were in VIP seats and Osmel Sousa of Miss Venezuela was seating far left. 3. Bunga Jelitha of Miss Indonesia cried a lot. When the top 16 were called and after the winner was announced. 4. Most non-Filipinos watching the pageant was expecting the Philippines to enter the top 5. They were shocked that Colombia was called and they find SA beautiful but too small to win the pageant. 5. People find Colombia so ugly. Some of the audience called her a “shark”. 6. Lu Sierra loves Miss Thailand. After the coronation, Lu Sierra hugged and consoled Maria Ehren. 7. 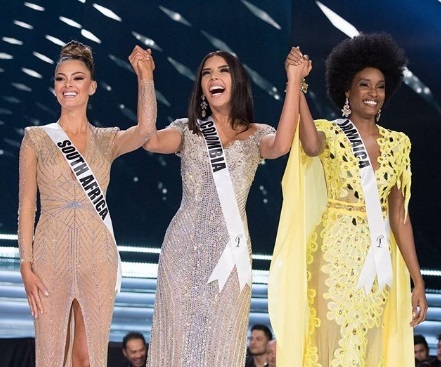 More girls went to Jamaica than the winner, Miss South Africa. 8. People booed after Jamaica was announced just 2nd runner-up. They wanted Jamaica to win. 9. Steve Harvey went to Miss Jamaica after the winner was announced and told Jamaica “You are perfect”. 10. Wendy Fitzwilliam’s seat was at the far right. She looked at the monitor most of the time to see the girls clearly instead. Pia’s seat was more near the stage. 11. Stever Harvey told us that he wanted Miss Brazil to marry his son.